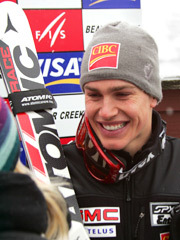 Editor’s Note: Erik Guay is one of the rising stars on a World Cup cirquit. Erik is a very strong technical skier and multiple Canadian champion in speed disciplines. He broke onto the WorldCup circuit in 2003 by placing 2nd in Lake Louise SuperG. After suffering a serious knee injury, he came back and claimed his place as a leader of Canadian speed team by finishing second in Beaver Creek and Val Gardena SuperGs. He also recently won downhill portion of combined in Val d’Isere. We here at YOUCANSKI.com have followed Erik’s carrer for quite some time, considering his athletic and efficient style of skiing to be a very good example of modern racing technique. After reading this interview, we hope many skiers, especially young athletes, may consider Erik as an excellent role model in his overall approach to the sport. Q: You are the leader of the Canadian team in the speed disciplines. What makes you so strong in the speed disciplines? A: I think is just training than anything else… We’ve had real solid training in the last couple of years. We went to South America to train with the Austrians for a little bit… and then just before Lake Louise we’ve trained with the Swiss team. Just having such a good group of young athletes to compete with… like John Kucera and … they all help me to push it on… It’s been a couple of years in the making and it is starting to pay off. Q: Do you think downhill nowadays favor bigger, heavier guys? If one looks at the finish line [in Beaver Creek], none of the guys are smaller than six foot (except Cuche, but he is more wider than taller). Q: When you practicing downhill, what are you concentrate on? A: That’s a good question… It depends on what’s not working out…. If you not really fast on the flats, then you working on being really smooth, supple with your skis, keeping 50-50% weight distribution, just really working over little bumps. If it is not working on the steep parts, then you’re working on the technical aspects. Maybe it will be helpful to do a little bit of GS skiing, to work on your technique and really work on skiing the curves, so it is really depends on each individual’s personal needs. Q: So what are your particular personal needs? Especially, after the injury, how difficult it was to come back? A: It was pretty tough… As far as technique, it comes back fairly quickly. But it is really the mental game to come back. It only takes a week before you start skiing properly, and the technique returns pretty quickly. It is a matter of getting that special feeling on the race day, when you let everything go and feel calm and confident and collected under pressure and really attack the hill. And that took me a little while to get back. Like last year, it took me at least half a year before I felt comfortable on my skis. Q: Obviously, a lot of people have difficulties to relate, but a lot of even recreational skiers do get injured tearing their ACLs. Is there any specific mental imagery, mental drills that you do to prepare yourself, to get your confidence back? A: Yeah, before I started skiing I was doing a lot of video, you watch the best skiers and you trying to keep the best things that they do, and then you are trying to apply it in your head, what they do, how they ski the course. And once you get back on the hill it is just a matter of time until you start to ski like before. Q: Who you consider the best skier? You just mentioned that you’re trying to pick up cues from the best… Who are they? A: (laughs) Ah, that’s a good one… Well, it depends on the race, so I usually watch the top five guys from every run. Hermann Maier, you know, is the technical master, he is so solid and strong, especially in technical parts of the course, so he was a big influence on me. Q: In terms of the technical disciplines… I believe that you started [your carrer] with good results in the technical disciplines… What are the differences in preparing yourself for GS vs. SG or the downhill? A: Well, as you said, when I grew up, I was a slalom and GS skier. It is really important for every skier to have a good technical base to build on. After that if you move into SuperG or downhill, it is the same principle, it’s just faster speed, bigger turns, you have to be more solid. You also work a lot on the flats, but the technical base is really important. Q: Could you provide a description of a perfect turn, what you body goes trough, what you are trying to concentrate on, from the initiation of the turn to the completion. A: That’s a good question… I’m going to be tough, I’m going to try and explain it. Let’s start, for example, in downhill, you want to run a really tight line, so it is not a “perfect” turn, you are obviously trying to create speed, and so are trying to spend a long time skiing toward the next gate [instead of turning], be patient with your switch, not to get inside too fast, keep your skis on the snow the whole time and then, when the turn begins, you really want to roll into it with your ankles, knees and hips, and then create a lot of pressure and sort of a build “pressure” trough [the turn]. I like to use a half-pipe as an example, when you go down and you push and you create speed coming out of it. The same principle in skiing, you get into the turn, and then you get a good angle and then you create speed coming out of it, and then you begin again. And it is the same for all disciplines. Q: Switching from the technical side to the material side… You, as a member of Canadian team, which has a little less visibility than, say, the Austrian team, do you think there is a little bit of a disadvantage for you in terms of getting the best [speed] skis? A: I’d say absolutely not. I have a serviceman who works directly at the [Atomic] factory in Altenmark. He makes my skis, he works with Bode Miller’s serviceman and Kalle Palander’s and everybody else’s. So if I want a different ski, like stiffer flex or faster base, he goes out and does it right away. So I don’t feel any disadvantage it that. Q: Could you describe a selection process for your skis? A: Typically, what I will do, I will take one pair from each individual, one model from Benjamin Raich, one model that Daron Rahlves skis on, one model that Aksel Svindal is skiing on, and then I’ll do a test day. I’ll go out and jus ski out there, with nothing written on the ski, so I don’t know whose ski I am using. And then I’ll get used to them and I’ll say “this one feels pretty good”. And then I’ll get into the course and do some timing and then I’ll choose the ski that I like the feeling of and on the [timing] results as well. And then, let’s say I ski on Benjamin Raich’s model, I’ll tell my serviceman, I’d like it to be a little stiffer in the tail, or a little softer in the tip, something like that. But now it isn’t the case, I actually ski on the same ski as Benjamin Raich. Q: For downhill skis, is there any difference? A: In downhill, there are several different models; I usually stick the model which my technician feels is the best for this temperature and humidity. The technicians have a special bond with their skis, they usually know which skis run best under what conditions. I try not to get involved, I trust my serviceman 100%. Q: Do you have a favorite course on the World Cup? A: I like all of them. It’s like when you go from Lake Louise, when the course is sort of flat and the snow is so hard and then you come to Beaver Creek, when there is a lot more difficult terrain, but the snow is so much easier. There so many of them… I particularly like Norway, it’s a great course, it flows really well, there is a lot of tough parts, and jumps and flats. So when there is a little bit of everything, I really like courses like that. Q: Could you walk us through your [course] inspection process? A: Inspections are a little individual. If you look at Bode Miller, who does it in a couple of minutes, that’s his personal preference, and he is able to do a great inspection in this amount of time. Personally, I like to take my time, I like to go down the course, really look at the little things. I sort of like to take the course three gates at a time, and see how I can create speed in that amount of time. Even if there is a tough part after that particular three gates, than at least I’ve made some time before that, and after that I can worry about this next gate that is really tough. A lot of the times there are those little things that you see that you didn’t pick up the first time trough and that’ll make a big difference. For example, in Beaver Creek SuperG, a lot of guys got caught on that 8th gate [near Pumphouse]. During inspection I stopped and climbed up there at least couple of times, and I knew it will be a tough part of the course. It was a little more open up top [before this gate], but when you came to this section, it was quite turny, so I knew, if you did not setup properly for this gate, you going to be in trouble. Especially with the soft snow that was there to the side and little rolls that were there… It is the little things that you have to take into account, if you stay on line, you going to create speed, and if you off the line, you going to end up on the soft snow. Q: There was a little bit of controversy after the Beaver Creek’s SuperG during the Team Captain’s meeting. Some of the team’s coaches said that their racers did not have confidence in FIS officials that allowed the race to proceed despite rather heavy snow. Do you feel one way or another about this? A: That’s a tough question… There are a lot of guys that had a lot of negative imaging in their head. And it is normal for an athlete, when it snowing, and its windy and there is tough visibility… It’s easy to be discouraged and be a little bit nervous about it. But if you look at both speed events, I don’t think there were any injuries, but if you look at Lake Lousie, which was great compared to Beaver Creek, there were quite a few injuries. So I think officials did a great job if nobody hurt themselves. Bottom line, we are here to race, regardless whether it’s nice, or snowy or windy, they will try to get a race and I think they did a great job to run it. Q: To touch another controversial subject, namely steroids in ski racing. 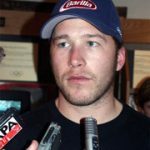 Bode Miller has stated that some drugs [that do not hurt athlete’s health should be allowed], at the same time Hans Knauss being banned for two years and was forced to retire merely for taking supplements that were contaminated by substances deemed illegal. A: That is a touchy subject. Hans Knauss, I know him, he is a GREAT guy, I really don’t think that he is guilty of that charge. I think he was using a protein supplement that happed to have some banned substances in it. It’s just depends on your view. I’m 100% on his side, I don’t thin he is guilty at all, but if they [FIS] would have let him “get away” with it, then the next guy would have taken a little bit more and push the envelope. So I think it was good that they have set the ground rule right away. I don’t use any protein supplements at all, I stay away from that in general. I just get everything I need from day-to-day food, that keeps my conscience clear and I don’t have to think about that when I go to do drug testing. Q: For young guys, who are still developing and working on their physique, what particular nutritional regiment you would recommend? Do you have particular training cycle when you prepare for the race? A: It is kind of a learning process… I spend years and years figuring out what I like to eat before the race, what will give me energy. We’ve had a team cook with us in Panorama, just before the season started, he cooked for us the greatest meal and I just inquired what he made and kept eating it… As far as the training… I’d probably say not to start too early. When you start training a lot when you are at young age, sometimes it can stunt your growth… I personally did a lot of cardio when I was a young athlete, and then I got into weights when I was 18-19 years old. Q: Is there any sports that you do in the off-season that helps your skiing? A: I do all kind of sports… I play golf, which I think helps me with my mind game (laughs). I play tennis which is very good for agility and moving around. I play soccer, basketball, volleyball. Q: Do you like free skiing in the off-season or after the season ends you are pretty much done with skiing?